The reign of Amenophis III marked the beginning of a new political era with a strong focus on diplomatic relations with neighbouring peoples and an economic upturn in Egypt. 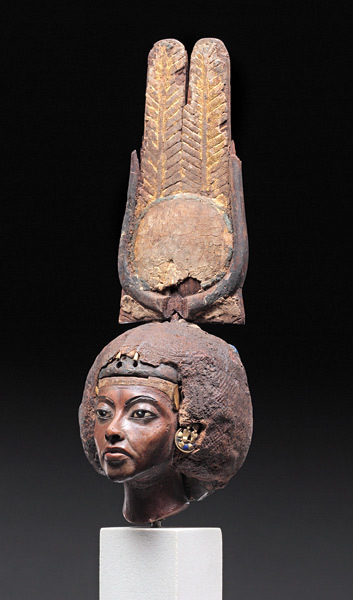 Amenophis III was unconventional in the choice of his 'Great Royal Wife', Tiye, who was in fact a commoner by birth. The royal couple had two sons. The first-born, Thutmosis, died young, leaving the second-born to succeed his father to the throne as Amenophis IV/Echnaton. 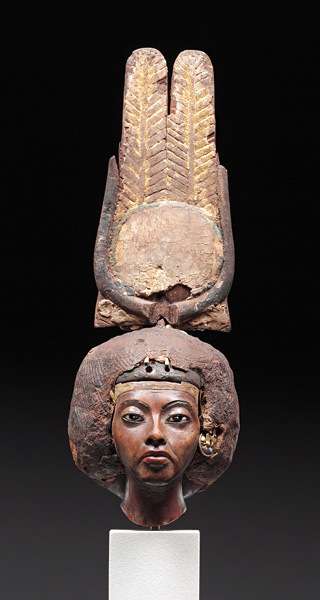 Tiye supported her son who raised her status from that of a queen mother to that of a goddess by reworking her famous head statue. Inv.-No. ÄM 21834, ÄM 17852 Tiy was the spouse of King Amenhotep III and mother of Akhenaten. This small portrait was probably produced in the last years of rule of her husband because the queen is shown at an advanced age. The artist produced a realistic face which captures the personality of Tiy: Intelligent, determined and assertive, all qualities which are also evident through historic-literary sources. 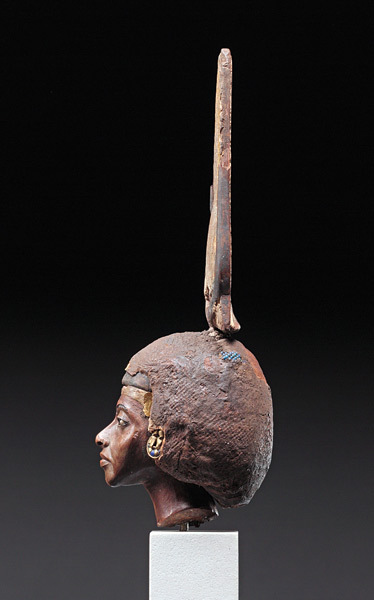 After the death of Amenhotep III and still in the lifetime of Tiy the head was reworked, the originally head scarf of silver with the gold uraeus was covered with several layers of linen which were decorated with small faience beads. A crown consisting of a sundisc, cow horns and a pair of feathers was added separately. This type of crown is usually worn by goddesses or deified queens. By adding this crown to the statue Akhenaton raised his mother, already in her lifetime, into the realm of a goddess. The crown was rediscovered in our collection after having been separated from the head for many years . Inv.-No. 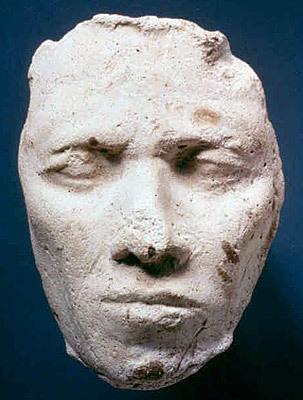 ÄM 21356 This life-size mask is one of a series from the workshop of the artist Thutmoses in Achet-Aton (today called Amarna), in Middle Egypt, which was the capital of Egypt during the reign of Akhenaton and Nefertiti. This portrait study gives a unique view of the work technique of the artist; first a form was taken directly from the sitters face and a gypsum copy was made from the mould. The copy was then finished by the sculptor in various details, especially the eyes since these had to be closed when the mask was taken from the face. In these rare instances we are directly confronted with 'real' people even if we do not know their names or anything else about them. Inv.-No. 14145 This small stele, probably used as a home altar, gives an seldom opportunity to view a scene from the private live of the king and queen. Akhenaton and Nefertiti are shown with the three oldest of their five daughter. While the daughters are being held and caressed by their parents the placement of the god Aten in the centre of the scene reminds of the official monotheistic religion in the Amarna period. 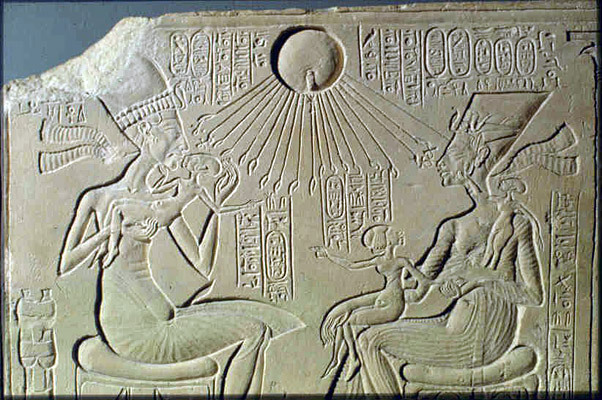 Aten is represented as a sundisc with sunrays ending in hands proffering 'ank'-signs (life-signs) to the royal couple. Only through the intercession of Nefertiti and Akhenaton could ordinary people partake in the divine salvation. The body forms shown on the relief, the overlong proportions, wide hips, thin legs and the forward curved necks, are typical of the early Amarna artistic style. Like his father before him, Amenhotep IV marries a commoner, Nefertiti, whose preserved portraits do justice in every respect to her name 'the beautiful one has come�". Before long they decide to build a new residence in Middle Egypt and there Amenhotep IV changes his name to Akhenaten ('Aten is pleased�") and gives homage together with his wife to the single god Aten, depicted as a sun disc with hands dangling at the ends of sunrays, holding symbols of life to the noses of the royal couple. A large number of craftsmen and artists settled in the new town in order to implement the new style of art propounded by the king. After a regency of just 17 years Akhenaten died, his town was abandoned and Egypt returned to its former gods. Inv.-No. ÄM 14512 The so-called 'excessive' style at the beginning of the Amarna period is especially obvious with this small relief study. 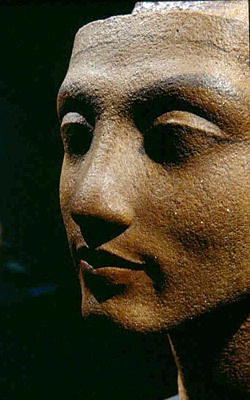 The thin face, heavy eyelids over narrow, slightly slanting eyes, long, hanging chin, long nose, emphasised nasolabial folds, full lips as well as the forward curve of the neck all characterize the early representations of king Akhenaton. The contrast between soft and sharp forms, weak and strong contours of the face have been excellently captured by the artist. 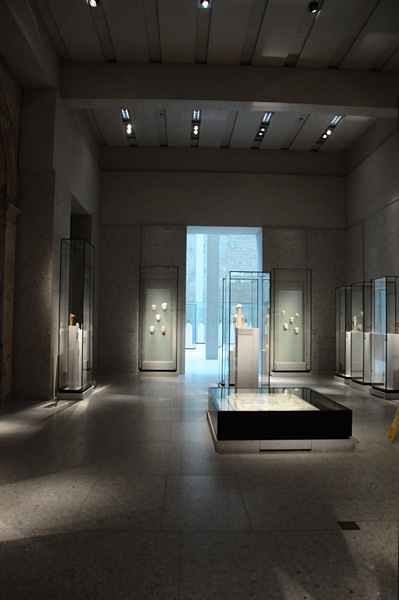 Numerous models and sculptures of the royal family were created in the workshops of Achet-Aten, many of them were left unfinished. 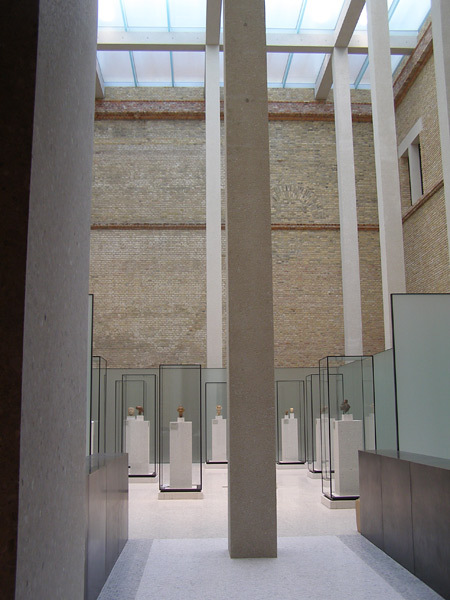 The reforms aspired by Akhenaten and Nefertiti were made recognizable in the representations produced for the general public. The strict right-angled axial symmetry of form was abandoned, facial features were represented more realistically. The new style of art is particularly striking in the heads of statues of princesses with exaggerated flaring skulls which is not to be attributed to genetic abnormalities or deliberate changes to the skull structure in infancy. The back of the head is an added artistic construct designed to form a harmonious continuation of the forward sweep of the extending neck and the protruding chin. Inv.-No. ÄM 21220 Eventhough this statue is unfinished it represents a masterpiece of late Amarna art with the characteristic almond shaped eyes, soft full lips lightly coloured red and the soft modelling of the face. The plinth on top of the head was originally covered by a separately work crown, the main indication that here a queen is represented. 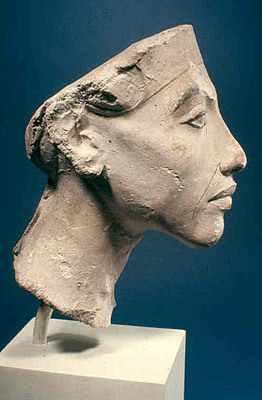 Possible Nefertiti herself is shown. or one of her daughters Meritaton or Anchesenpaaton married to Semenchkare and Tutankhamen respectively. Inv.-No. 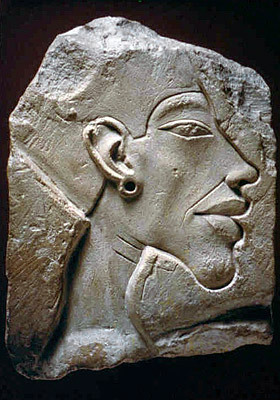 ÄM 21351 The typical characteristics of the face of Akhenaton can be found here: triangular face, thin chin heavy eyelids long straight nose with accentuated nasolabial furrows and hollow cheeks and very full lips. The diadem at the forehead and the curved section over the ears indicate that the blue crown was part of the sculpture and therefore a king is indicated. The black painted lines in the area of the nose chin and eyes also indicate that the sculpture was not yet finished as were many sculpture found in the workshop of Tuthmosis in Amarna.